Bolle's Duchess is their newest snow goggle for women, incorporating the most advanced technologies that ensure a wide, unrestricted and fog free field of view and superior protection for eyes. Bolle &apos;s Duchess is their newest snow goggle for women, incorporating the most advanced technologies that ensure a wide, unrestricted and fog free field of view and superior protection for eyes. All of Bolle&apos;s lenses exceed American National Standards Institute (ANSI) requirements for UV protection, impact resistance and optical clarity. It&apos;s more proof of how they not only promise, but also deliver the very best, time and time again. Bolle Equalizer technology uses a waterproof, breathable vent to eliminate any moisture. The result is distortion free vision and no fogging at any altitude. Wide field of view ensures maximum peripheral view, necessary when you are flying through the slalom gates or spinning to spot a landing over your shoulder. 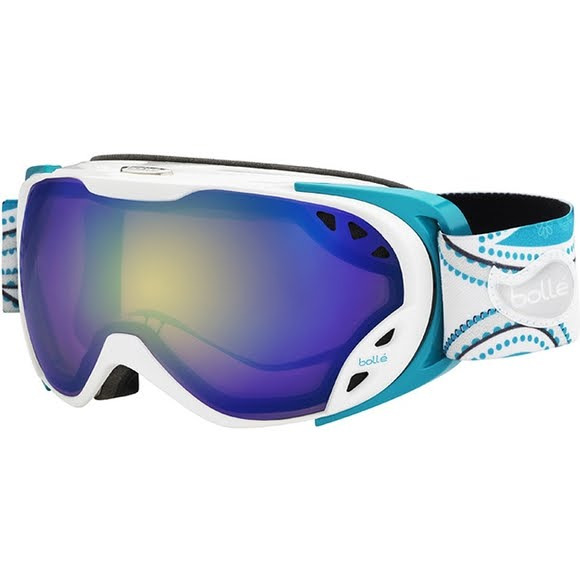 The Gravity features a unique new spherical shield, designed with a steeper curve to provide face- hugging fit and the widest field of view in a spherical goggle. Ultra soft micro-fleece is the only material on your face, backed by two layers of multidensity foam for a firm soft fit. Swinging outrigger to maintain perfect fit with helmets. All Bolle lenses block harmful UVA/UVB rays up to 400 nanometers. Amber lens with blue mirror coating for increased contrast. This lens is ideal in overcast conditions and also delivers great visibility in sunny conditions thanks to its mirror coating. A pink lens with a gold mirror finish that enhances contrast while maximizing colour definition. Suitable for both cloudy and clear weather, this versatile lens delivers incomparable style. Pink lens with silver mirror coating that brings out contrasts and maximises colour definition. A pleasure to wear in both cloudy and sunny conditions, this versatile lens delivers excellent optical comfort. Orange photochromic lens made in polycarbonate, with a slight silver mirror that adapts instantly to changing light conditions. This technically advanced high contrast lens changes colour, going from dark orange in bright conditions to light orange in low light. Pink photochromic lens made in polycarbonate, with a slight blue mirror that adapts instantly to changing light conditions. This technically advanced lens changes colour, going from dark pink in bright conditions to light pink in low light.